The Nordic House is the administrative office for the Nordic Council Environment Prize. The Nordic House in Reykjavík has administered the Nordic Council Environment Prize since January 2016. The work is carried out in close collaboration with the Nordic Adjudication Committee as well as the Nordic Council of Ministers and Nordic Council. The Natural Resource Council of Attu on the west coast of Greenland has been awarded the Nordic Council Environment Prize 2018 for its work on documenting the marine environment and proposing new ways of managing it. Per Ole Frederiksen, Pâviârak Jakobsen och Nette Levermann receiving the prize from the Prime Minister of Norway, Erna Solberg, live on TV from the gala at the Opera House in Oslo. The theme for the Nordic Council Environment Prize 2018 is protecting marine life and helping to achieve the UN Sustainable Development Goals. The idea behind the prize is to raise awareness of environmental work in the Nordic Region. it has been awarded since 1995, along with the Nordic Council’s other prizes. The prize goes to a company, organisation or individual for exemplary efforts to integrate respect for the environment into their business or work or for some other form of extraordinary initiative on behalf of the environment. The Nordic Adjudication Committee consists of 13 members: Two from Denmark, Norway, Sweden, Finland, Iceland, and one from the Faroe Islands, Greenland and Åland. The Environment Prize is worth DKK 350,000 (approx. €47,000) – the same amount as the other prizes – and is run and managed by the Nordic House in Reykjavik. 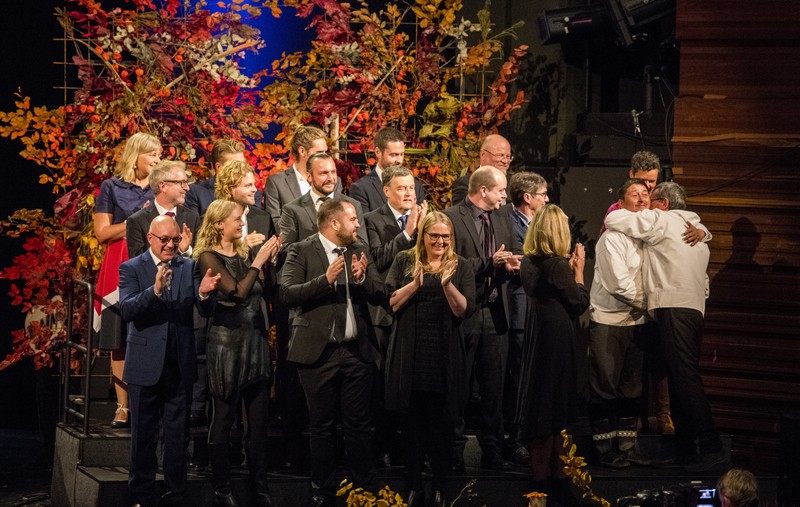 The prize is usually awarded alongside the other Nordic prizes for literature, music and film at a special ceremony during the annual Session of the Nordic Council in autumn.